Searching this morning for an easy fruit salad recipe, an apple granola photograph popped into my head I’d shot awhile back for Yum Food and Fun for Kids’ winter issue. The recipe comes from Menu Mom Christine Steendahl. I can only take credit for the picture and styling. Serves 6. Prep time: 5 minutes. Recipe by Menu Mom Christine Steendahl for Yum Food and Fun for Kids magazine. Winter issue 2010. Picture by Laura Flowers. my family makes an unhealthy version of this recipe, ha. i like the look of yours, and it just looks like it would taste fresh. yumm- thanks for sharing! I'm loving the marshmallow addition. 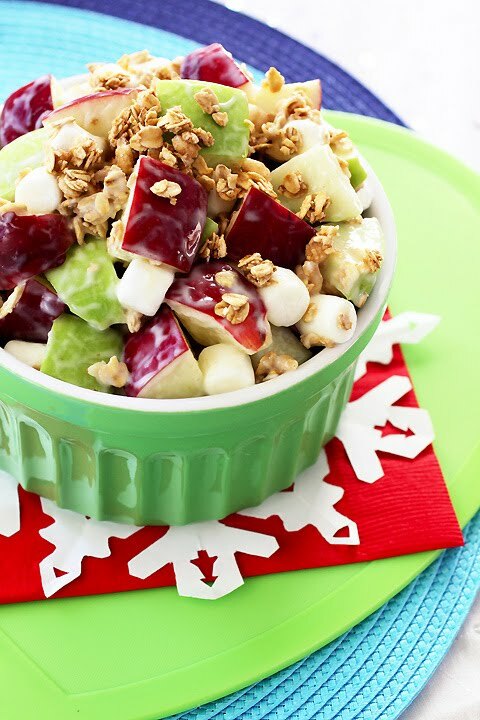 This is the kind of fruit salad I could snack on while studying. I am loving this salad. This looks so good. I know plenty of children AND adults who would devour this salad. Bring on the fruit and marshmallows. Thank you for sharing your words and this recipe. And thank you for your kind thoughts on my own blog. I appreciate you!